The beef and lamb dishes at this seaside eatery are reliable, but the kitchen’s strength is seafood – especially scallops, shrimp and grouper, served in various combinations with a selection of sauces. The Alma Beach setting allows for excellent al fresco dining to the sound of the waves. Sizeable indoor and outdoor dining spaces can easily accommodate families and large groups, but call ahead for reservations. Port Said draws crowds of young, hip Tel Avivians at all hours of the day, many from the tech start-ups that line nearby Rothschild Boulevard. Don’t let the chaos of beautiful people and blaring music distract you from celebrity chef Eyal Shani’s well-executed Israeli cuisine. The sharing-plates menu changes with the day and season, but the minute steak, served sizzling on a cast iron platter, is a mainstay. Dishes are heavy on smoky eggplant, artichokes and beets at this Israeli hybrid inspired by the communal dining halls of the kibbutz. The restaurant is often packed and noisy, but the brisk, friendly service and location next to the Opera House make it an ideal spot to grab a quick bite before a show. The place isn’t fussy, the queues can be colossal, and you’ll probably have to share your table with strangers, but the legendary hummus at this Jaffa institution makes it all worthwhile. Order “The Triple,” which includes creamy hummus, fava beans and masabacha (like hummus, only with whole chickpeas) served with raw onions and hot sauce. Eating it can get messy, but don’t dare request serviettes. Located on the roof of the beachside Carlton Hotel, Blue Sky is one of four restaurants in Tel Aviv from renowned chef, TV star and food writer Meir Adoni. Get ready for the most refined kosher dining experience in Israel: The cuisine combines Asian techniques and inspiration with local ingredients (mostly Mediterranean seafood), and the wine list is vast. Come on Friday afternoon for Adoni’s Far East-inspired brunch – think eggs tempura or smoked salmon banh mi. You can’t miss this juice kiosk, located at the corner of lively Dizengoff and Ben Gurion Streets, thanks to its throngs of customers, piles of fruits and fringes of fresh herbs. Try the classic carrot-ginger juice or the orange, mango and strawberry smoothie. Or, if you’re feeling adventurous, opt for the iced coffee with bananas or a date-and-pomegranate-based concoction. Located in the gentrified Old North part of the city, Room Service is always open, but we recommend going for brunch; the bright Shakshuka – eggs cooked in a spiced tomato sauce – is a must. Snag a table on the corner patio and watch people make their way a few blocks west to the beach while you sip a house cocktail. Enjoy a bowl of zesty gazpacho at this chic, minimalist café; then sample a hafuch, Israeli’s answer to a latte, where the espresso sits between layers of steamed milk and foam. The coffee pairs perfectly with the housemade pastries, ice cream and cakes. The hangout of choice for Israeli film insiders, Orna and Ella is also a favourite for in-the-know vegetarians. These free outdoor gyms may look like playgrounds for grown-ups, but they’re way more than just a jungle gym. After a run along the beach, gaze out at the Mediterranean while doing push-ups and body-weight squats on the primary-coloured workout stations. Since the first deserted hangar was revamped over two decades ago, Tel Aviv Port (Namal Tel Aviv in Hebrew) at the north end of the city has grown into a chic social hub. While the sun is shining, stroll along the rolling wooden boardwalk, nibble your way through the Barcelona-style Markets Building and buy local fresh produce at the farmers’ market on Tuesdays and Fridays. In the evening, throw on party attire for a dining, drinking and dancing tour of the numerous bars, clubs and restaurants. One of the largest museums in the world specializing in the story of the Jewish people, this longstanding institution explores diaspora and history as far back as 4,000 years. Don’t miss the wing that opened in 2016, featuring a history of synagogues and a children’s gallery. Israel’s leading museum of modern and contemporary art features paintings by Miro, Pollock and Picasso alongside major Israeli works, including sculptures by Itzhak Danziger and Rudi Lehmann. The museum is part of the city’s Golda Meir Cultural and Art Center, which also houses the Cameri Theater and the Israeli Opera – both worth seeing if you can snag tickets. Every inch of the walls at the Under 1000 gallery is covered with artwork, from paintings to drawings to photography. Pieces by emerging artists hang next to those by established Israeli names like Moshe Kadishman and Yair Garbuz. All items in the gallery are for sale, and the maximum price is around ILS4,000 ($1400). Located in the developing neighbourhood of Florentin, Under 1000’s exterior walls (like most in the area) are covered with evocative street art. The original homes, town hall, school and other buildings of 19th- century German settlers have been preserved and redeveloped as shops for top international brands and local designers. At the heart of Sarona is one of the city’s best food markets; find top-notch cheeses at Basher Fromagerie and desserts at Halva Kingdom. With its sky-high piles of fruit, vegetables, cheap clothing and costume jewellery – plus enough shouting, bargaining and jockeying to make your head spin – the Carmel Market is a must-visit. Come hungry and try the cheap, plentiful street food, like cheesy breadsticks from Mafiyat Lechemim or grilled meats at M25, the restaurant wing of one of Tel Aviv’s best butchers located next door. Take a break from the heat at Beer Bazaar and quench your thirst with one of the 80 Israeli craft brews on offer. Two art deco buildings comprise this 50-room luxury property located on a quiet street. Take a yoga class in the Tower Garden, then plunge into the rooftop infinity pool for views of Tel Aviv’s skyline. Have dinner at one of the onsite restaurants: Alena Restaurant offers French Mediterranean cuisine and Dinings serves Japanese fusion. Designed by Canadian Karim Rashid, this hotel combines modernist and post-modernist esthetics in a repurposed building at the nexus of Tel Aviv’s main streets. The 40 rooms impress with trompe d’oeil murals and futuristic furniture, while amenities include complimentary bike rentals, a cocktail bar and a spa. Breakfast is a daily treat at this hotel’s elevated outdoor resto-bar; plus you can walk directly from your table (or from the lobby) onto the sands of Hilton Beach. Jewish cuisine, from kosher classics to gefilte fish, gets new life from Meir Adoni, the celebrity chef and local dining magnate who owns two restaurants on-site. Its state-of-the art spa includes a well-equipped gym, Turkish sauna and personal trainers for hire. The Diaghilev fuses modern with historical and art with life. In addition to accommodating guests in a restored Bauhaus property, the hotel plays host to numerous art and design exhibitions. Head to the Backstage Bar, where the decor is inspired by the backstage of Ballet Russes – a Parisian dance company founded by hotel namesake Sergei Diaghilev. Located in the Bauhaus building that once housed the Esther Cinema (Tel Aviv’s first movie house), this hotel charms with old-Hollywood touches like original movie posters and projectors. Watch the sun set from the rooftop bar, which overlooks Dizengoff Square; then head to the lobby for a bag of popcorn and a free screening of a classic flick. This posh boutique hotel in a stunning 1920s heritage building is just steps from picturesque Rothschild Boulevard. (Make sure you book well in advance to stay in one of the 12 rooms.) Stylish extras include gourmet picnic baskets and a hip main-floor brasserie with a decor that hints at French Indochina. In Tel Aviv’s northern end, the Port Hotel boasts an enviable rooftop patio, great value and a prime location in the heart of The Port’s nightlife scene. Seaside clubs and bars are just 100 metres away and come alive every weekend with twenty- and thirtysomething revelers. Explore nearby HaYarkon Park, Tel Aviv’s largest green space, by going for a stroll or a jog. Ben Gurion International Airport is located about half an hour from the city centre by car. A taxi stand is located near Terminal 3 on Level G, and a ride into central Tel Aviv should run between ILS130 and ILS180. The train gets you into the city for ILS13.50, but there is no Sabbath service. Find the train station below the airport, on Level S.
These mini-buses can hold up to ten people and run along two of Tel Aviv’s major streets, Dizengoff and Ben-Yehuda. There are no set stops, so simply hail one of the blue, red or yellow vehicles as it approaches, and pay the driver, who will let you out anywhere along the route. Official public transit does not run late or on Saturdays, so these private buses are a great alternative. Tel Aviv is a remarkably bikeable city. Dedicated lanes on most major streets make it easy to zip past the frequently stalled traffic. Many hotels have bikes available for guests, and cycle rental shops abound, but the city’s public bike system, Tel-o-Fun, is often the best way to get from point A to point B. Docks containing the bikes are located throughout the city. (They’re especially prominent near the beach promenade.) Use your credit card to obtain a bike from a station, then drop it off at a dock close to your destination. White taxis abound on the streets of Tel Aviv. Metered rides are obligatory, but cabbies will often try to haggle for a set rate. The Gett app is also a convenient way to get a taxi that will take you to your precise location, and it will charge your credit card for the metered rate, eliminating any bartering with the driver. Compact Tel Aviv is perfect for strolling – just arm yourself with a map. From creamy hummus to handmade shoes, here's how to balance your budget in the south Tel Aviv neighbourhood. 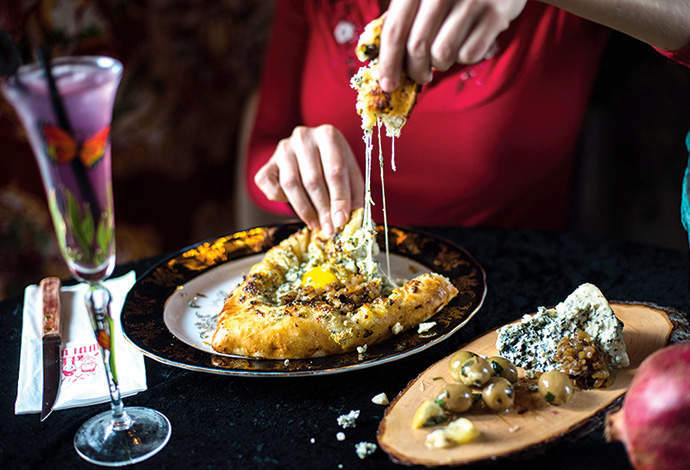 Carved out of an old Ottoman building, complete with a domed stone ceiling, this modern Georgian restaurant serves up classics, like salty khachapuri (cheese-filled bread) and smoky eggplant stuffed with tahini. Dinner is accompanied by live music and dancing, as cheering patrons raise their glasses of Old Tbilisi wine. Don’t let the long (but fast-moving) lineups prevent you from trying some of the best cheap eats in Tel Aviv. Bowls of warm, creamy hummus, served with slices of sweet white onions and fluffy pita for scooping, are delivered by endearingly gruff waiters. Designer Tal Arbel works at a big wooden table in her sunlit studio/shop, creating shoes and bags from fine Italian leathers. She takes inspiration from frequent visits to Italy, but has a flair for abstract design as well: She 3-D-printed a geometric pair of stilettos – made of resin and leather – for an art exhibit. This hip design studio models itself on an old-school souvenir shop, selling screenprinted T-shirts, bags, enamel pins and postcards made by a collective of local artists inspired by destinations around the globe. The little warren is covered in colourful posters, shelves full of old issues of National Geographic and tiny animal figurines (not for sale). Pick up a playful monkey-print backpack or a laser-cut hanging airplane mobile. Top-notch charcuterie platters, pickled herring, fresh oysters and Israeli wines are served in a dark and narrow bar, which feels a little like a secret library hidden in the middle of an eclectic antiques market. The stalls open at dusk, so show up early to hunt for treasures before snagging a table. This beloved, cavelike club is a popular watering hole with both Jewish and Arab locals. It opens late and stays hopping well past midnight, with sweaty millennials dancing to a live DJ – who spins everything from reggae to classic rock – and spilling out onto the sidewalk, mojitos in hand.